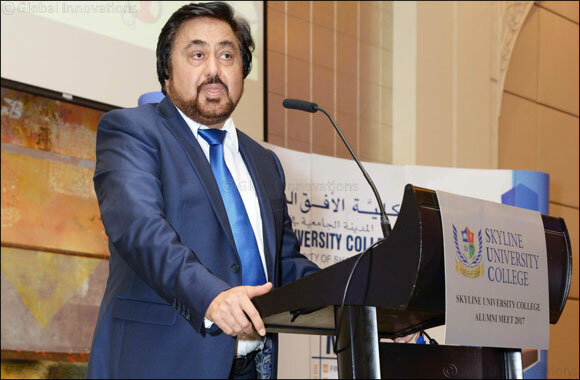 Skyline University College welcomed SUC graduates dating back from the year 1999 to 2016 at the 15th Skyline Alumni Meet on May 17, 2017 in Shangri-La, Dubai. The venue was filled with familiar faces clad in suits and formal attires – a manifestation of how the Skyline alumni have evolved since their university days. Skyline Founder President Mr. Kamal Puri graced the occasion and jumpstarted the event with his inspiring speech. An engaging panel discussion on “The Effect of Digital World on Work Culture” took place with the invited panelists from the corporate and alumni namely Mr. Jihad El-Eit - Jeetek Group Founder and CEO, Mr. Mahesh Shahdadpuri - TASC Outsourcing Founder and CEO and Nikai Group Director, and SUC alumnus Mr. Faisal Bashir - DU Enterprise Channel Marketing Director. An interactive session followed the discussion to get the views and thoughts of the alumni audience. The event has successfully aimed at bringing together the past students in one place that comprise the SUC alumni today since SUC’s establishment. It served as a meeting place for old friends to reunite, for alumni to catch up with their professors and mentors, and to engage themselves in an intellectual panel discussion. The SUC Alumni Association has put together the event with a mix of fun in the means of games and raffle draws with its sponsors Air Arabia and Shangri-La Hotel. SUC Dean Dr. Amitabh Upadhya, Quality Assurance Head Dr. Sudhakar Kota, Deputy Director for Public Relations Mr. Firas Al Tabbaa, Deputy Director and Head of Marketing and Creative Communications Mr. Rakesh Gaur also graced the occasion along with SUC professors and SUC department heads.